Guided Bass Fishing – Night time needle lures a PB! 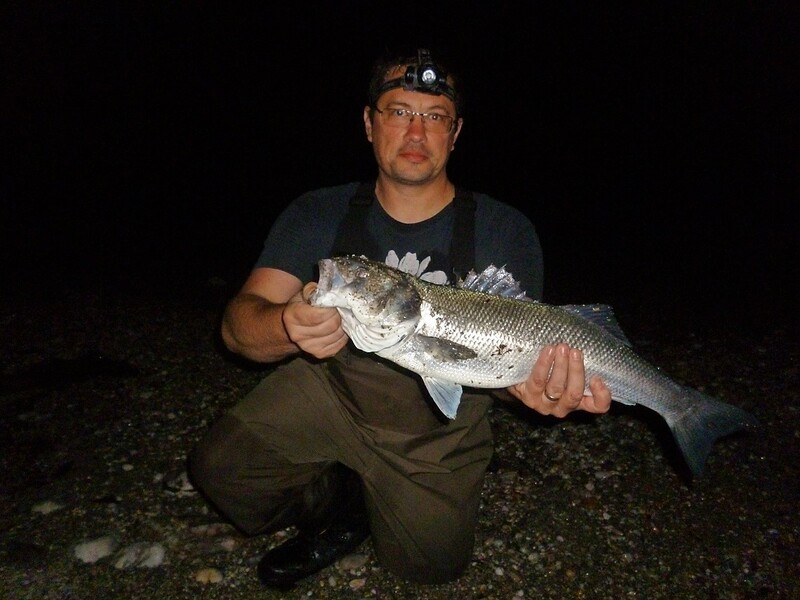 I’d been considering it for a while – guiding a client at night from a shingle beach in search of a lure caught bass… It has been a regular occurrence for me this season – I’ve taken them on white senkos, sub-surface minnows and surface lures in complete darkness during the (limited) occasions I’ve been out. So I hatched a plan! George was my first client this season back in late March during a sunny day where he learnt a lot but caught very little – nothing in fact. What made it worse was that the very next day (in totally different conditions) my next client nailed a beauty therefore, when George commented that he wanted to experience another session I offered him the chance to try something that until a few months ago, I didn’t think would be achievable – guiding in darkness. Now George lives some 80 miles away from south Devon therefore, this was a bit of a trek for him at the end of a long day at work but this guy is super keen to learn the intricacies of lure fishing for bass. He’s captured some lovely fish upwards of 9 lb on bait but has achieved limited success (notwithstanding a haul of 1 – 2 lb bass on surface lures in Wales a few seasons ago) since he turned to this increasingly popular method of catching them. Indeed, bar a small one taken on a Storm Chug a few weeks back, he has really struggled – well that was about to change! It was just after 2100 on a very warm and humid evening that I met up with George. We had a good 1 mile walk to the stretch I wanted him to fish therefore, there was plenty of time to chat, point out marks and talk about what I hoped he’d achieve once proper darkness had set it – due to be around 2212. I explained that the mark was essentially a long stretch of shingle where an almost continuous reef runs parallel to the shoreline. The reef is covered by about 6″ to 1 ft of water once the incoming tide reaches the shingle whereby the depth then increases to about 3 – ft depending on the tide height – which tonight was a neap of 4.5m (Salcombe scale) with HW due at 2330. The mark in question has yielded bass for me on lures in rough onshore conditions (South/South-West or West winds) as the current (and associated wave movement) generally push food items (and weed unfortunately) into the area. But tonight, it was one of the places I had earmarked for my client. There are a couple more interesting features about this mark – the first is a gully that runs at 45 degrees to the beach some 30 metres out at HW and the other what best can be described as a ‘bowl’ or tennis court sized rock pool about 100 metres further along the beach. He’d driven a long way and was itching to get fishing! So upon arrival on the beach there was still 30 minutes of daylight therefore, I encouraged George to target an area well away from the proposed ‘night venue’ (leaving the area completely undisturbed) with a weedless weightless senko in the form of an OSP DoLive Stick, followed as dusk really set in by an IMA Salt Skimmer. The day had been very calm, warm and the settled and as the half-moon appeared, so the mist and low cloud gradually enveloped the cliffs around us – it was quite eerie at actually… The sea was gin clear and flat with a very occasional small (1ft) swell rolling in. On the previous evening I’d actually seen two fish (Sea Trout?) jump clear out of the water on the ‘night venue’ therefore, it did take a bit of will power to leave it well alone! However, within a few minutes of fishing a number of swirls and a couple of prickly fins appeared in and around where George was casting his lures! Surely one would nail his lure! But no, they just weren’t interested which actually didn’t surprise me too much, as in my experience, it seems when the bass are most visible on the surface they are seldom in the mood for taking lures from the shore…. Very odd and I’d be interested to know if other anglers have experienced this? George continued to fish this area until it was officially dark (about 2215) which when you’re allowing your eyes to gradually get used to the darkness you don’t really realise how dark it is unless you turn on the head-torch. We’d had a chat and I’d pointed out where I wanted George to concentrate his efforts – but the initial lure choice was all his idea. I’d planned to start him off with a subtle white 6″ senko, then a needle fish lure and then a surface lure before moving to another beach nearby, if he didn’t get any action after an hour or so. George however, was really keen to attach his brand new 7″ white needlefish lure (courtesy of Jim’s Lures ) to the clip – remembering a session where a client wanted to use a Fiiish Black Minnow continually because he had confidence in it, my answer was ‘no worries mate! ‘Good luck buddy’ I said to him as he made his first cast, aimed at the tennis court sized ‘pool’ some 30 metres out in the gloom… The first couple of casts were quiet affairs therefore, I started to move away back towards our kit just to get us a drink when I heard him shout ‘Yes!!! Got one!! I quickly scurried over the pebbles and shingle towards George only to see the rod straight and back in the 45 degree angle with him winding in… The bloody thing came off and it felt like a big one to me was his response! I was gutted for him but encouraged him to cast into the same area again…. WALLOP!!! The bass absolutely hammered the lure about 7 metres from his feet in about 2ft of water and the HTO lure rod was getting a nice little work out. But there was no way this one was coming off as George expertly brought it into the shallows, whereby I flicked on the red light to my head-torch in order to grab it. Absolute perfection laid before us. 3 lb of pure predatory power and beauty glistening in the moon light – what a way to catch a bass and proof that these very innocuous looking needlefish lures work a treat. A couple of photographs (I’m still getting used to photographing fish at night) and the bass was carefully returned – George was bouncing all over the place and hugging me and all sorts!! 3lb of perfection! – Smile George! But this was just the start! I’d had a sneaky feeling that this was going to be a memorable session but I really didn’t want to tempt fate so had kept my mouth shut until George’s rod slammed over again about 5 minutes later – he’d received three more bites in as many casts by this stage! The second bass was of a slightly smaller size (around 2 lbs) but was welcomed with the same enthusiasm as its mate – this was going really well and we still had a couple of hours of fishing time yet! On practically every other cast and subsequent retrieve George was receiving a ‘knock’ on the needle-fish lure. There must have been a fair few fish out there on the shallow reef and the bites appeared to be coming in waves, much like I’d commented to George on the way to this mark from my own brief forays into night lure fishing. But with another fish lost during the battle and things gradually starting to quiet down I suggested that we move along the shore the 100 metres to the ‘gully’. First cast ‘WHACK’ a fish grabs at the lure but doesn’t hook up… A few more turns of the reel and a solid hit and run sees the rod and angler bent into another bass – I can’t wait to come back and try this for myself I’m thinking! (more on that in my next post!) Another bass is photographed and returned and then I remember I’ve got my Go-Pro tucked away in my rucksack! I was so enthralled and caught up in the session I’d forgotten all about it therefore, I was willing George to nail another one so I could try to capture some footage of a bass being returned – something I’m keen to do more of. With the half-moon sporadically shrouded in mist George moved back to his original position (following someone else randomly walking along the beach with a bloody search-light on their head!) and continued to cast and retrieve his new ‘favourite lure’ And it wasn’t long before he hooked into a real head shaker after initially thinking he’d snagged a rock – was this the big one we’d both wanted to see? Once again though, it managed to shake the hooks! Urrrgghhhhh… However, a few casts later and another ‘YANK’ on the rod at a range of 5 metres saw George grinning with delight as he manoeuvred the bass onto the shingle to his left. I didn’t realise how large this bass was until I saw it in the red glow! It was a big one and my initial thoughts were that it was 6 lb+ We were both completely delirious by this stage and our own head-torches were switched on as we both wanted to enjoy this moment for all it was worth – it’s not everyday you catch a 62cm bass (5 lb) from the shore. I was so pleased for George as he held it up for the camera and sure enough the Go-Pro was unleashed to average affect (see below) as he released his prize back into its home – a wonderful moment. George did land one more bass, again in the 2.5 lb range, before we decided to call it a night… Sweating like pigs and still completely buzzing, we eventually got back to the cars at 0142 – I had told my lovely Wife that I’d be back at 0200 but I don’t think she’d believed me as I don’t normally fish that late into the night! So what was the secret method that enabled five stunning bass to be landed, in addition to countless hits and at least two other lost fish? Cast the lure out into the vicinity of the gully or pool, hold the rod up at 45 degrees and retrieve the reel at approximately one full turn per two seconds. The way these deadly ‘needles’ are designed, they simply sweep up in to the water column and ‘swim’ about 3 or 4″ under the surface – well away from all but the snags and rocks protruding above the surface (of which there are a few around the mark). When I say ‘swim’ the lure basically does very, very little but ‘coast in’ on a straight retrieve, with the most subtle slalom action I’ve ever witnessed on a lure. There is no vane or lip, the lure just glides back towards you just under the surface – it is an unbelieveably simplistic way to catch a bass. 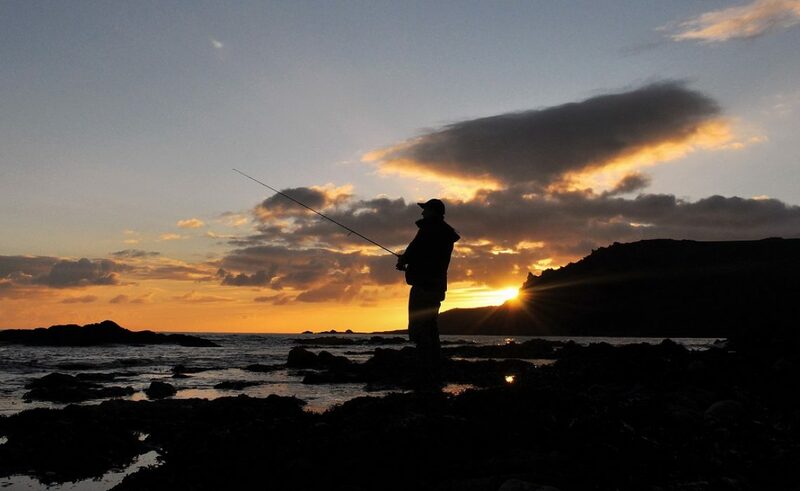 Firstly, I have no intention of lure fishing at night from the rocks – no bass is worth being washed in by a rogue wave that I’d never see coming therefore, any night fishing will be conducted from beaches were I, or any prospective clients, would have a chance of hearing or running from! Secondly, I am extremely excited about the potential of this method for bass – both within my personal fishing and from a future marketing perspective. I know many of my fellow lure anglers have been catching them at night for years, but this is something I almost avoided doing previously as I never thought I would ever be guiding in the dark. I’d always concentrated on my marks during different wind, tide, weather and sea conditions in preparation to becoming a guide to concern myself with chasing them in the dead of night – boy, has that changed now! Thanks for reading, and if you have any comments or observations I’d love to read your views or hear about your own experiences. Next My Recent Catches – Darkness offering more consistency.